Get your new switch ready for installation, inspect the switch, make sure that all pins inside the two plugs are straight. When you plug in the connectors and the pins are bent in any way, there will be no connection established and your new switch will not work properly. Disconnect the negative battery terminal. It will prevent any electrical short form occurring as well as prevent the air bag from accidentally deploying. 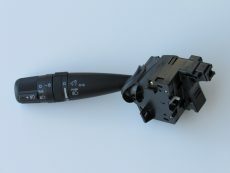 To gain access to the multi-function switch, both bottom and top parts of the plastic steering column shroud will need to be removed. Using the T20 TORX screwdriver, remove three screws from the bottom part of the plastic shroud. Reach inside the plastic panel below steering column and pull firmly to release the clips holding it in place. Pull the clips out on both sides and tilt the panel down to remove it from hinges on the bottom. Pull the steering wheel adjustment lever all the way down. Locate the separation line between top and bottom plastic steering column shrouds. Squeeze gently just below the line to release clips holding both shrouds together and pull bottom shroud down. Separate the bottom shroud on the right side as well, carefully sliding it over the ignition. Remove the bottom shroud completely and set aside. Push the steering wheel down and carefully remove top steering column shroud. Using a Phillips screwdriver, remove screw holding the switch in place. Gently slide the switch partially out. Carefully remove the two connectors from the switch. Each one has a small tab you need to push down to remove it from the plug. Do not rush it and don’t force it out. Set the old switch aside and grab the new one. Inspect the connectors and make sure nothing is bent, broken or melted. Slide the new switch back into place. Make sure everything lines up correctly. Carefully plug in both connectors. Reinstall the Phillips screw. Reinstall top steering column shroud. Reinstall bottom shroud staring on the ignition side until both top and bottom parts snap back together. Lock the steering wheel in your preferred location with the adjustment lever. Reinstall the panel below steering wheel. Begin by lining up bottom hinges and push the panel up until in clips back into place. Reinstall all three screws on the bottom steering column shroud. Reconnect the negative battery terminal. You might have to reset your clock and radio settings. 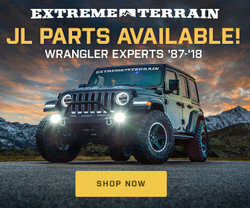 Take your Jeep for a test drive and try out your new multi-function switch.